"This ensemble has a cape made of tufted coffin lining in a lovely shade of cemetery grey. This little number was very inexpensive. The fabric is made of black widows webs, and the underslip, pure unborn centipede." Vampires and superheroes aren't the only ones donning capes this week. Fashionistas around the world are embracing the whimsical accessory that can make you feel mysterious, powerful, or part of a fairytale. Capes, popular for both costumes and everyday wear, have been around for centuries and continue to be a great accompaniment to any fall wardrobe. 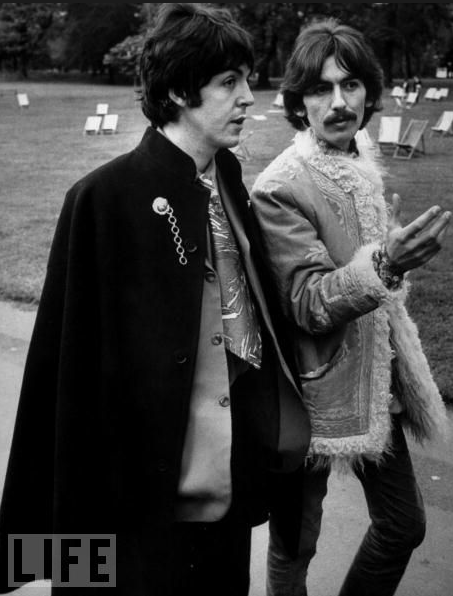 Audrey Hepburn, Jacqueline Kennedy Onassis, and Paul McCartney gravitated towards the versatile outerwear. 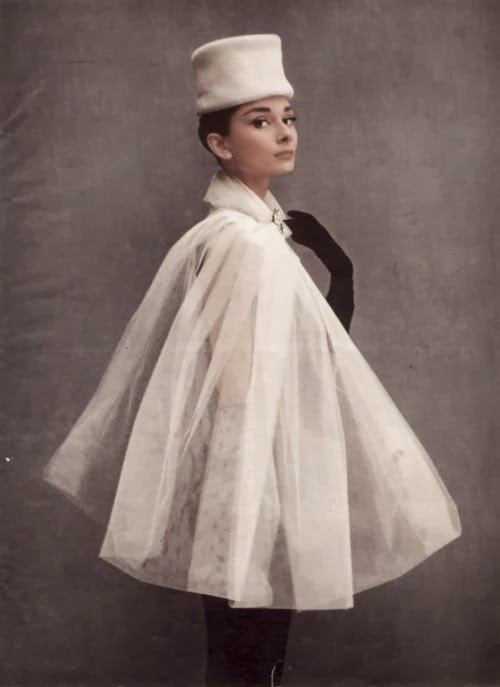 Hepburn wore a beautiful floor-sweeping blue cape in the movie Funny Face that was designed by Hubert de Givenchy. Once she had been draped in one of Givenchy's exquisite designs, she could never go back. “His are the only clothes in which I am myself,” she told reporters in 1956. Jackie O selected an elegant white cape for her husband's inaugural ball in 1961. Ethel Frankau of Bergdorf Goodman created both the gown and the cape. Capes can be dramatic or subtle and made out of anything and everything from organza to fur. Who wouldn't want to own an accessory that Red Riding Hood, Dracula, Superman, and the Queen of England can pull off? My sons both opted to be superheroes this year for Halloween and lo and behold, they will be sporting capes. Having never owned one myself, I decided to make a cape using an exceptionally soft Marc Jacobs wool that I purchased from Mood. Not wanting my arms completely confined, I added openings adorned with zippers on both sides and a zipper up the middle. It was surprisingly easy to make. I learned how to insert the zippers within the garment via a YouTube how to video. I also found time to make a pair of pleated, tapered black pants and a red top with lace accents. Cheers to the cape!